SÃO PAULO, BRAZIL – Despite the current economic woes faced by the country, Brazil’s federal government announced that as of January 1st, 2016 the minimum wage will increase by 11.6 percent to R$880.00 per month (US$228.00), which corresponds to R$4.00 per hour. In 2015 the monthly minimum wage was of R$788.00 (US$220.00). Brazilian government increases monthly minimum wage for 2016 to R$880 per month, photo by Marcello Casal/Agencia Brasil. According to government officials the yearly increase of the minimum wage has always been a priority for the Rousseff Administration. “With the decree signed by President Dilma Rousseff, the federal government continues its policy of maintaining the value of the minimum wage, with a direct impact over nearly forty million workers and retirees who currently receive only the minimum wage,” said the statement released by the Presidency’s communication office. The budget for the minimum wage approved by Congress at the beginning of December for 2016 called for a minimum wage of R$871.00. According to economists, the impact of the 11.6 percent increase will lead to an additional R$30.2 billion in government spending next year. 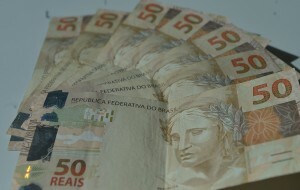 The Ministry of Planning had forecast an impact of R$25.5 billion in the government’s budget bill. The policy of the maintenance of the value of the minimum wage was started in 2003, during the administration of President Luiz Inacio Lula da Silva and calls for the annual increase to be determined by the inflation of the previous year plus the variation of the country’s Gross Domestic Product (GDP) of from two years prior (2013). Inflation in 2015 is expected to close at 10.28 percent. How the heck does a monthly minimum wage work? Do they only get paid once per month or something? And even so… what if they don’t work 40 hours every week of that month? They get the same amount regardless? Very strange.